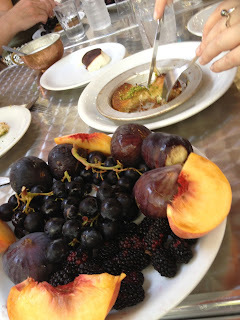 Greek Food Odyssey - cooking classes, recipes and travel: Byzantium, Constantinople, Istanbul!!!! I’ve said it before, I’ll say it again. I love this city. Give me Istanbul over Paris any day! I’ve been to the old city about 4 times. Every time I visit I experience something new. 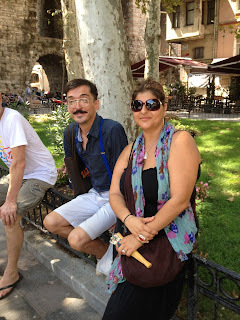 The first couple of times I went with an organized group from Greece. 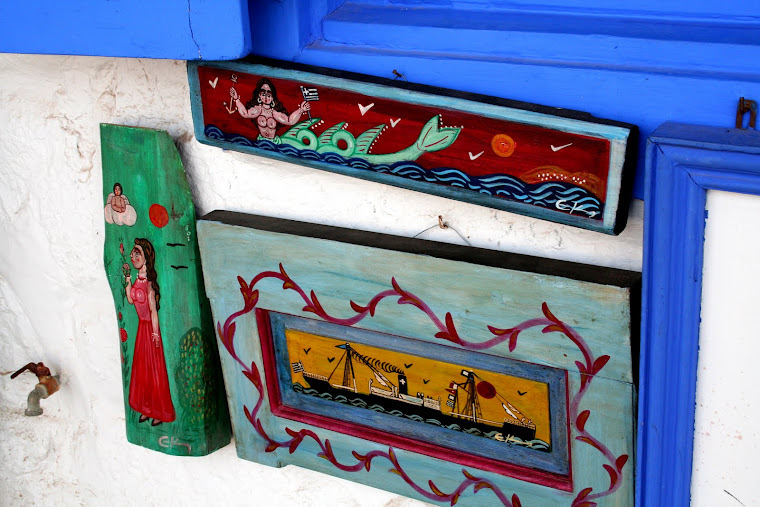 It was a tour of the Greek Byzantine churches and the Prikiponisa “Princes Islands”. Our trip in 2006 was a week of celebrating our best friends, and godparents to our Evangeline, wedding. Chris and Mary organized a bus trip for us all whilst they were organizing the last minute details of their wedding. We went to really funky bars on the Bosphorus and other little places that tourists would only be lucky to stumble upon. 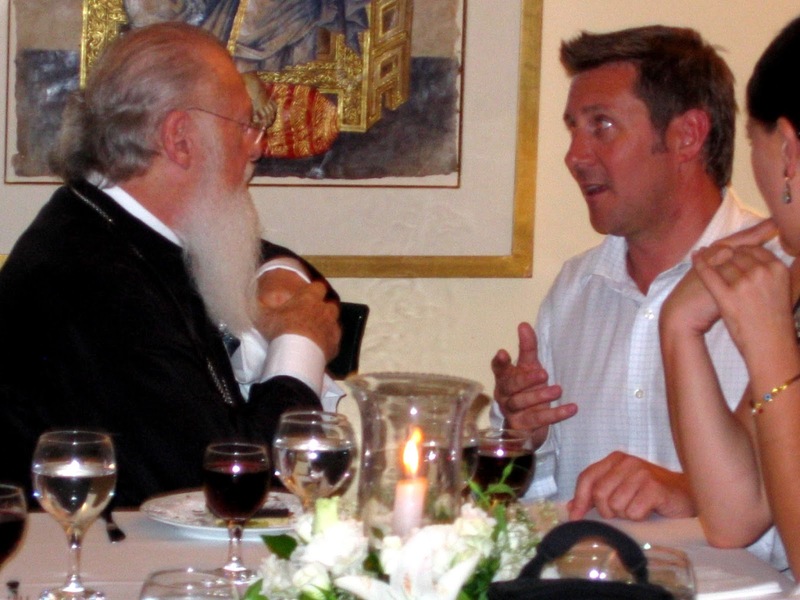 Their wedding was held at Fanari and performed by Chris’s uncle, His All Holiness, Bartholomew I, also referred to all of us as “Bart”. Chris’s popular Black Rock café is also named after him….Uncle Bart…. This trip to Istanbul however was purely for business! The business of food! 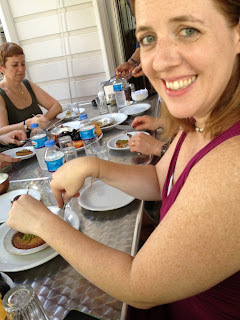 I booked an organized food walk tour with a company called Istanbul Eats for Lee and our friends from Wonthaggi. It was the best $120 I have ever spent. I specifically asked for Angelis as a tour guide purely for the fact that he was Greek as I am currently researching cuisine of Constantinople and Asia Minor where my grandparents happen to come from. He was hilarious, knowledgeable and his passion for this city was contagious! The relationship Angelis has formed over the last few years with the locals is one of genuine mutual affection. Being fully aware of the Greco-Turkish history, it was heartwarming to witness and considering all the horrible things that are currently happening in the world, particularly in the Middle East, it really did give me hope for humanity! I know I sound a bit over the top but I come from Asia Minor Greek stock and anyone who is aware of the history will know exactly what I mean! We met at the front of Yeni Cami (New Mosque) adjacent to the foodie heaven, Egyptian Spice Bazaar. We were a small group of 8 including Angelis. From literally the first second we were welcomed like long lost friends. We grabbed a few items for breakfast from the outside shops of the Bazaar, including the deliciously wicked kamaik and honey and then spread out our goodies on newspaper on a table belonging to a tiny little teashop in a two shop arcade. 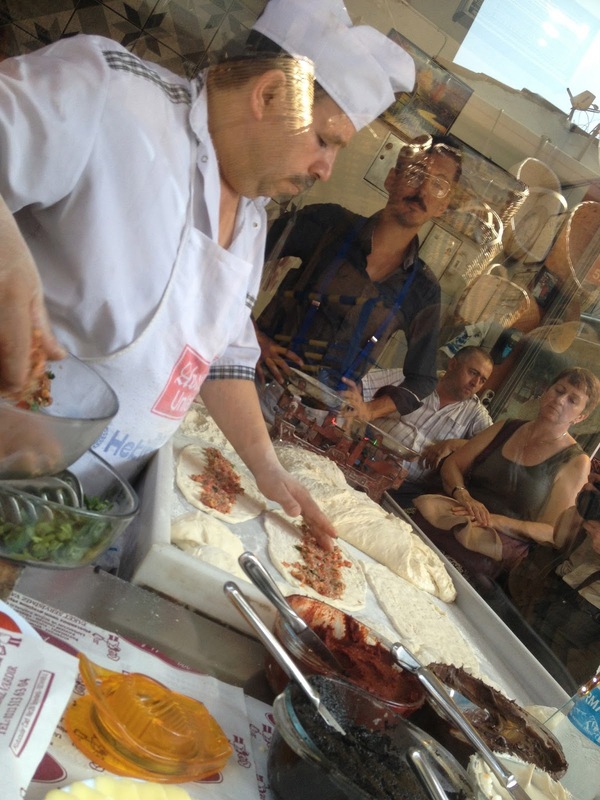 The team behind the magnicent baclava..and Angelis hard at work..Wish I had his job!! We then went baklava tasting…single filo pistachio stuffed cigar shaped ones, traditional ones, chocolate ones, triangle ones with custard and nuts…the list goes on! 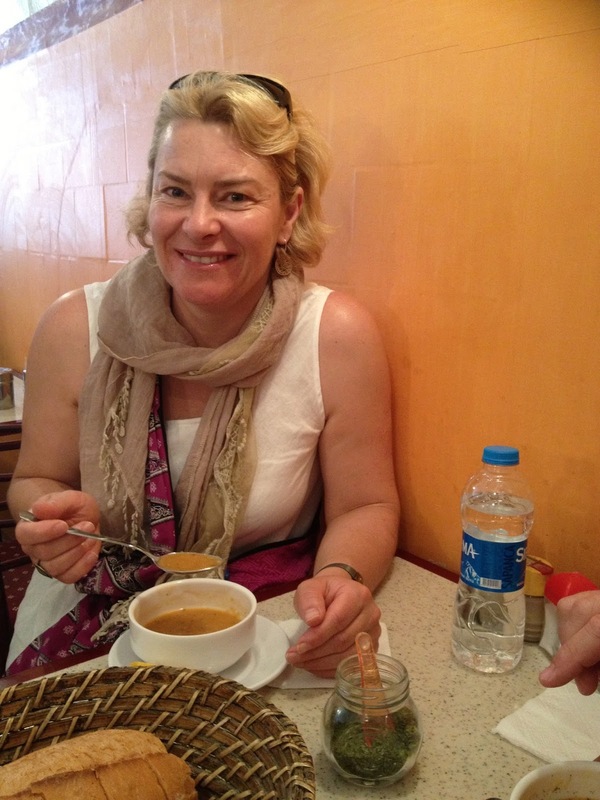 For a bit of a cleanser we then stopped off in a little shop for a nutritious bowl of lentil soup. This arched shaped establishment, which seats about 20 people, was hundreds of years old and used to and still does feed people who work close by and want a traditional home cooked meal. Not only for the offal lovers...Lee loved it & Pin had two!! Our next stop was one of my favourites. The UTLIMATE street food. Cokorec! This little beauty is basically fat, sweet breads wrapped in intestines and cooked on a rotisserie over hot coals. It then is cut into serving portions, chopped up and grilled with tomato and served in a crusty bread roll. 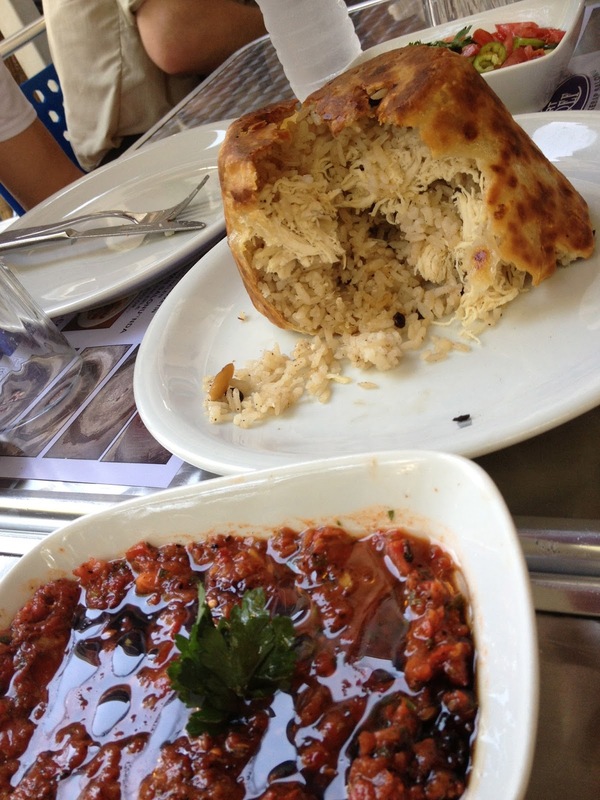 I swear I’m going back to Istanbul just for this! 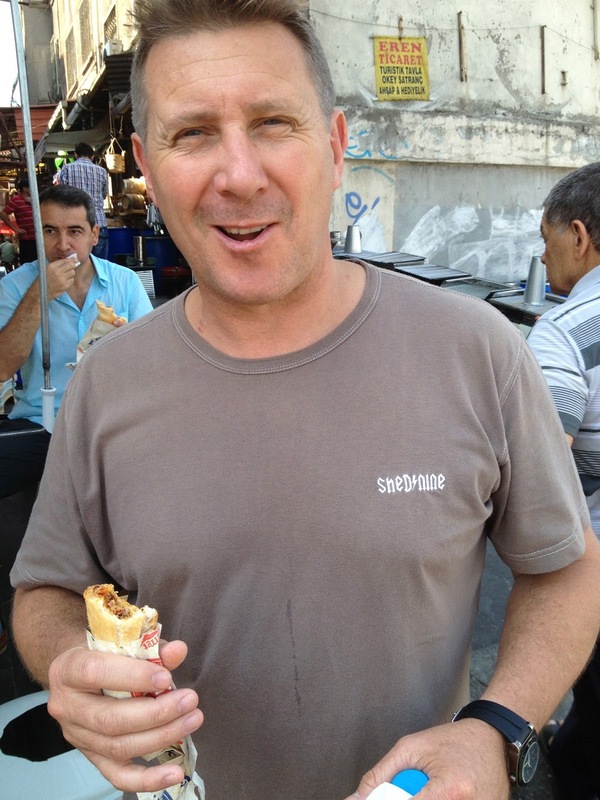 If that didn’t have our taste buds in a rage we visited this gorgeous man who has being making pide for 30 years. He filled them up with sucuk, kavourma, pastourma and pieces of raw meat peppers and tomatoes. Delicious! Stop number 7 was at a loukoum “Turkish Delight” and lolly shop. 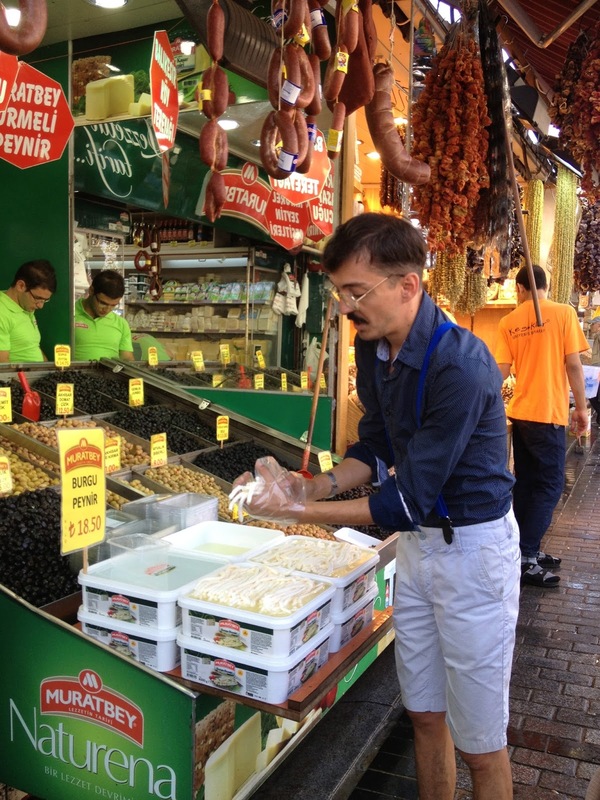 This shop was run by the 4th generation Altanoglu family. We were lucky enough to meet the son of the original owner. He was a lovely old man, about 90 years old and I will never forget the look of joy on his face as we were sampling all the goodies. I couldn’t resist. A box of pistachio loukoum is coming to Melbourne with me! Next was a stop at a caravanserai. Traditionally these were used as roadside inns where travelers could rest and recover from the day's journey. Caravanserais supported the flow of commerce, information, and people across the network of trade routes covering Asia, North Africa, and southeastern Europe, especially along the Silk Road. 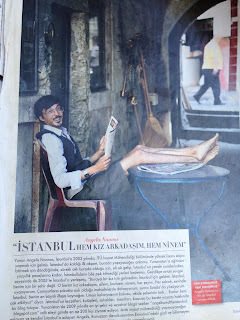 On this day we used this recently converted outdoor theatre as an apple tea stop and used the break to reflect on our journey thus far and also have a look at a fantastic article written about our guide Angelis and Istanbul Eats in the Turkish equivalent of our Vogue Entertaining & Travel. Next the almighty doner kebab. Incredible! 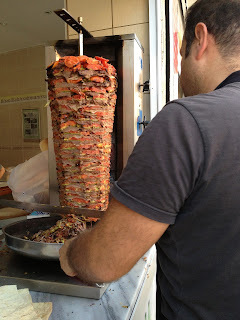 Layers of thinly sliced spicy beef and lamb, mince meat, tomatoes & peppers wrapped in a thin pita bread. 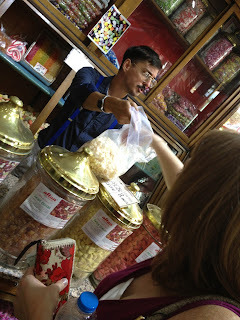 We then visited an Ottoman era bozaci and sampled a beverage that requires an acquired taste. It is made from fermented millet, sprinkled with cinnamon and topped with roasted chickpeas. 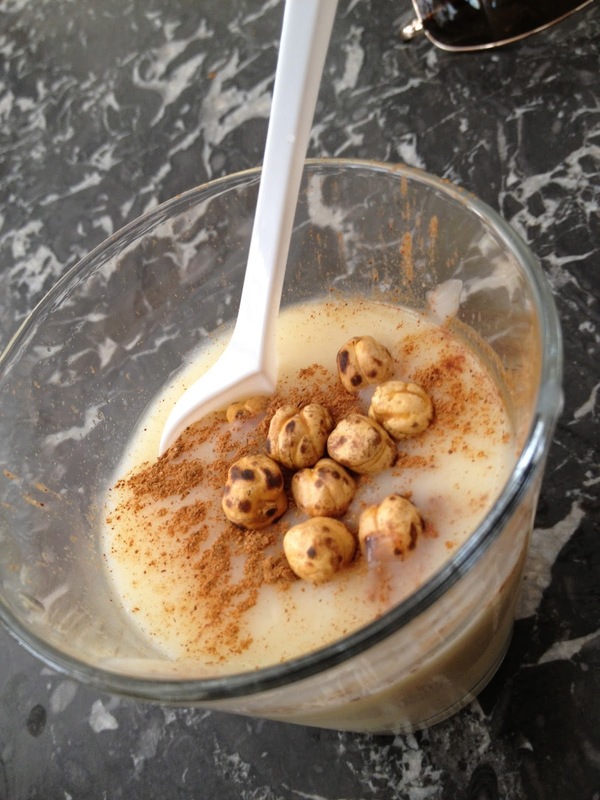 It looks a like and has the consistency of sweetened condensed milk…It is a bit of sweet/sour on the palate. 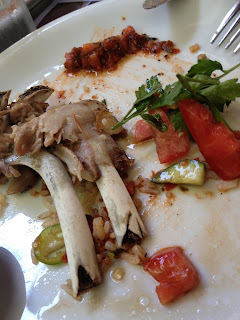 Our final stop, and we were stuffed to the hilt by this stage, was a full lunch of traditional pit-roasted lamb in a very local, family-run place next to the Byzantine aqueduct. It was delicious, melt in your mouth lamb served with various side dishes and finished with fresh fruit we purchased from one of the many stallholders on our journey and my all time favourite kunefe! A syrup soaked kataifi and white cheese concoction. 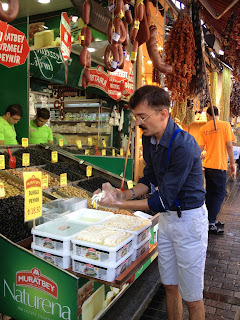 I encourage EVERYONE who travels to Istanbul to take a day, preferably at the start of his or her visit, and book a culinary walking tour with Istanbul Eats. I promise it will be the highlight of your trip. Once again thank you Angelis, Istanbul Eats and the beautiful people of Istanbul for an unforgettable day. 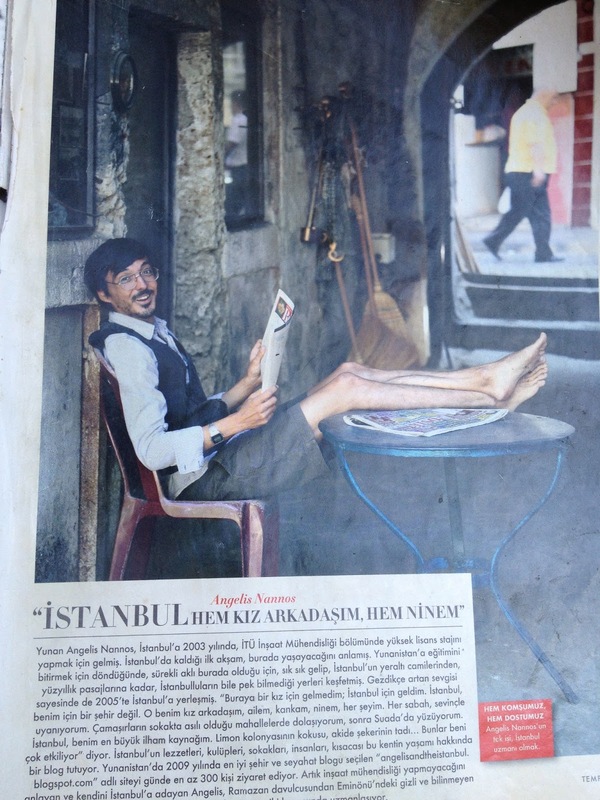 Fishing at Galata bridge...little fish taverns under the bridge..Genius!